Home Fact-Check Fact Check : Did PM Modi thank HH Sheikh Mohammed for Rs 700 crore aid to Kerala? Kerala has been grappling for the past few days with a debilitating flood that has ravaged the state. Over 350 people have lost their lives and thousands have been rendered homeless. The relief activities have been on with the armed forces and central government working alongside the state government to bring some semblance of relief to the citizens. Many leaders from across the globe extended support and condolences in the wake of such a disaster. Many politicians back home, however, were busy in using the floods to play petty politics. Amidst the chaos, news surfaced that UAE had offered to extend Rs. 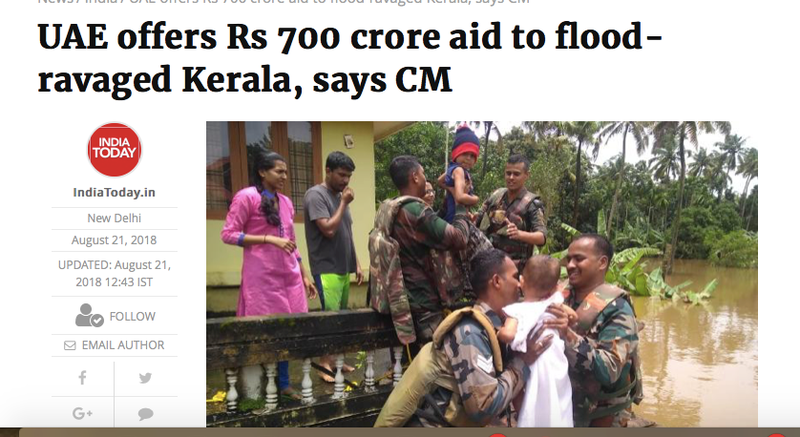 700 crores to Kerala as disaster aid and that the Indian government was unlikely to accept the assistance. While the reasons for not accepting foreign aid during a natural disaster is a norm set from the year 2003, many took the opportunity to lash out at the Modi government unfairly. Today, however, the UAE ambassador categorically denied extending any such disaster aid to Kerala. Many questioned how this lie was furthered in the first place. Upon digging, one finds that it was the Kerala CM who had taken to Twitter to announce that UAE is planning to provide assistance of Rs. 700 crores. In many news reports, it was also said that Kerala CM was informed by Lulu supermarkets owner Yusuf Ali, that UAE had planned to extend such assistance. After the Ambassadors denial, however, the issue should have ideally been laid to rest, but, many used it to further another conspiracy theory. Many took to social media to assert that the UAE government had issued a clarification because of “pressure” from the Modi government, considering it showed the Modi government in a bad light since UAE was offering more financial assistance than the central government. To prove this hypothesis, they included a tweet of Prime Minister Modi thanking the Prime Minister of UAE HH Sheikh Mohammed for extending assistance to Kerala. They asserted, that if UAE had not extended the aid at all, PM Modi would not be thanking the PM of UAE. Prime Minister Narendra Modi’s tweet is timestamped 6:06 AM on 18th August 2018. The news of UAE extending support to Kerala to the tune of Rs 700 crores came after the gratitude tweeted by Prime Minister Modi. Khaleej Times tweeted the news on 20th August 2018. The official Twitter handle of the Chief Minister’s office tweeted its gratitude for the same on 21st August 2018. Most news outlets also covered the news on 21st August itself. The News Minute reported on 21st August 2018, at 1:57 PM. India Today reported the news on 21st August, 12:43 PM. The Hindu reported it on 21st August, 1:47 PM. And Khaleej Times reported the Kerala CM’s expression of gratitude on 21st August, 11:28 PM. Hence, it becomes logically impossible for the Prime Minister to be thanking HH Sheikh Mohammed for the purported Rs. 700 crores disaster aid to Kerala considering the Prime Minister tweeted early morning on 18th August 2018. When one looks further, one realises that HH Sheikh Mohammed bin Rashid Al Maktoum, the Prime Minister and Vice President of UAE and the ruler of Emirate of Dubai had tweeted a generic call to support. He had tweeted that the state of Kerala in India is current witnessing huge floods and that ahead of Eid Al Adha, he urged everyone to “not forget to extend a helping hand to brothers in India”. HH Sheikh Mohammed bin Rashid Al Maktoum tweeted on 17th August 2018. HH Sheikh Mohammed had also tweeted on the same day that UAE has formed a committee and urged people to contribute generously towards relief efforts. As rules for accepting foreign aid formulated by former PM Manmohan Singh goes, India can accept donations from NGO’s and private citizens. However, there was still no news of the Rs. 700 crore aid from the UAE government that is being purported now. 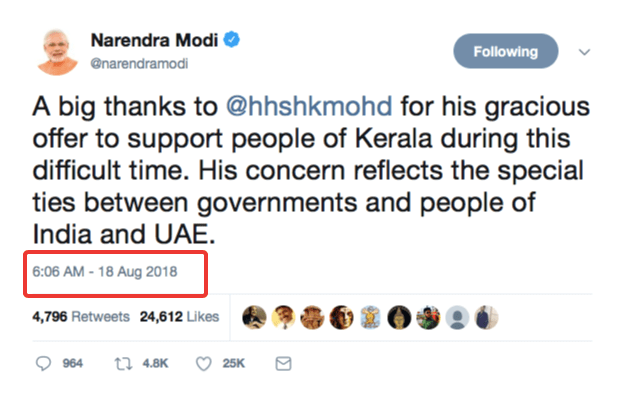 It thus stands to reason that Prime Minister Narendra Modi expression of gratitude towards HH Sheikh Mohammed bin Rashid Al Maktoum was not for the purported extension of Rs 700 crores disaster aid, later proven to be false news, but for his tweet extending support to Kerala and his call to help ‘brothers in India’ in the wake up devastating floods.